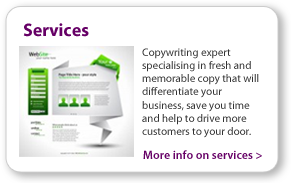 There are plenty of qualified copywriters in the UK, so why choose me? I'm bubbly, enthusiastic, I don’t bite and more importantly, I know what I am doing. But if you have any doubts, I have the testimonials to prove it! "Hannah has helped my agency with sales copy on our own website and our client proposals and I don't know how we'd manage without her. Creative writing is not the strong point of any of our team so it's a joy to have Hannah on call to see if there is a better way to convey what we're trying to say without the constant repetition we used to have. I now consider how Hannah can improve each and every project we work on. She's a joy to work with and you won't be disappointed if you hire her!" 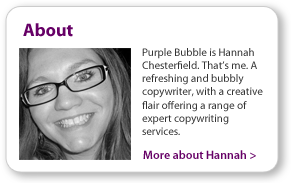 "Hannah has produced the highest quality copy we have set our eyes on. The level of detail and in-depth subject knowledge is a joy to read. We highly recommend her." "Hannah did a number of pieces for our website including blog posts and product descriptions. We couldn't have been happier with the work and it was all delivered in a timely manner. She was able to get up to speed on our product ranges extremely quickly and with minimal guidance We'd highly recommend Hannah for any copy writing work." "We asked Hannah to look at a few of our products to improve the quality of the content on the website product pages. Hannah managed to write the product descriptions with a real flair and creativity which suited our target market perfectly. She made the products seem so aspirational and sold their unique selling points in an interesting and readable way. Hannah produced the content quickly and to the time specified. We were very impressed with the work and will continue to use Hannah and have recommended her to others already."